Our second day in Tbilisi was great. 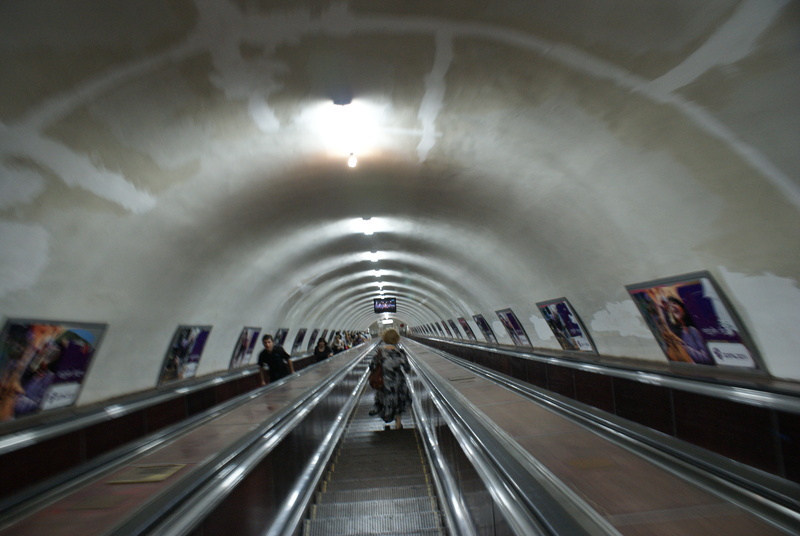 Descending to the Tbilisi metro. We decided to try out the Metro. A remnant from Soviet days, the Tbilisi metro was like going down a mine – the escalators just carry on, deeper and deeper into the earth until they reach the platform. Certainly deeper than any other underground system I have been on before, including London. There are TV screens hanging from the ceiling playing commercials and showing the philharmonic in action, to help one pass the time. The trains themselves were efficient and pretty clean. No complaints. We started the day where we had left off the day before – on the opposite bank of the river. We explored another church and some huge statues, before going back to the ancient bathhouse area. We were learning that in Georgia one can expect to see churches – hundreds of them everywhere, and statues – the bigger, the better. High above this area is the ancient citadel – we planned to walk up but were advised to take a taxi – it’s really not far, maybe half a kilometer – but it was another baking day and the route was very steep. The taxi ride took about 2 minutes. At the top there is a great view of the city, and not much else to do, as apart from the impressive ramparts nothing much else remains. 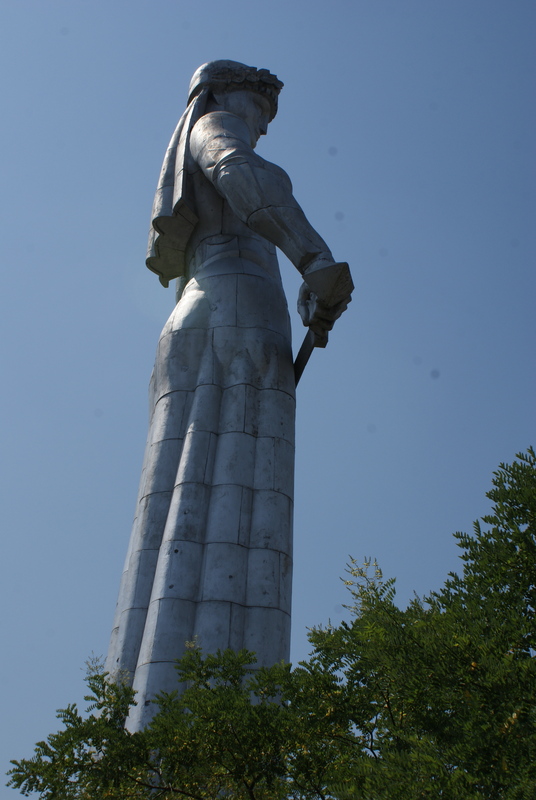 I walked with Eitan for about 15 minutes to the statue of Mother Georgia – erected in Soviet times – a huge metal statue of a woman that overlooks the whole city. Impressive! While we went on our small walk, the rest of the family waited in the shade at the tiny snack stand at the citadel. When we returned, they told me of the drama that they had witnessed. When I left them, there had been a sheep grazing under a tree – when I returned it was gone. They had seen someone drive up, truss up the sheep, throw it into the trunk of the car, and drive away. Seemed like the sheep’s future was very doubtful. Back down from the citadel, we were amazed to see a huge group of Israeli tourists. We hadn’t seen any other foreigners except for the odd backpacker here and there, but we learned that Israelis were visiting in droves. The reason was clear – for the past decade Israelis have visited Turkey en mass, but relations between Israel and Turkey are now strained, and Israelis have moved on to Georgia – same distance, cheap and interesting. After some quality ice cream and English bookshop time, we made our way back “home” to our apartment. As night fell, the skyline was lit up by a huge TV tower that dazzles with its neon display – incredibly exuberant, the tower is almost an attraction in itself. The kids had wanted to visit an amusement park near the tower, but from what I could find out, the owners had gone bankrupt, most of it wasn’t working, the roller coaster – touted as the biggest in Europe, had actually never been built, and so we decided to give it a miss. PS: These days I am helping families plan trips to destinations on five continents. Click here for more info. 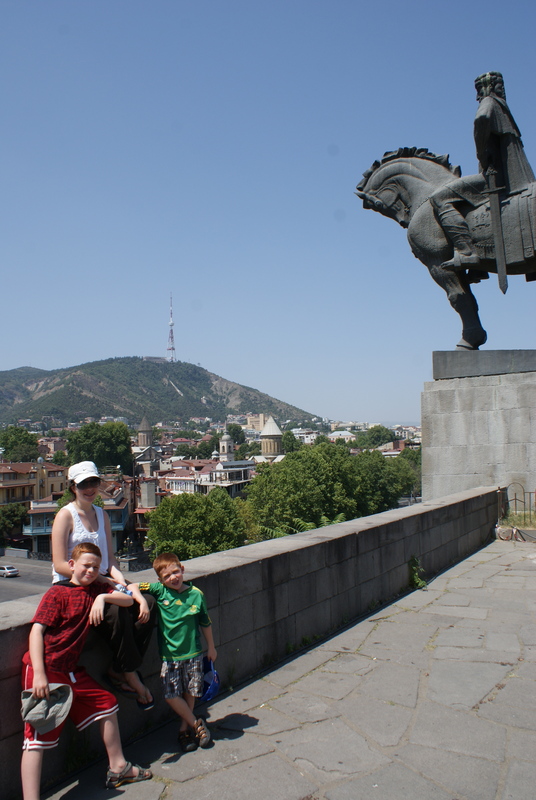 « Tbilisi with Kids – Food and Drink!